The PHE analysis found that 29 per cent of children in the UK are living with at least one parent reporting symptoms of emotional distress. The data was taken from a study of around 40,000 households in the UK for 2016 to 2017. 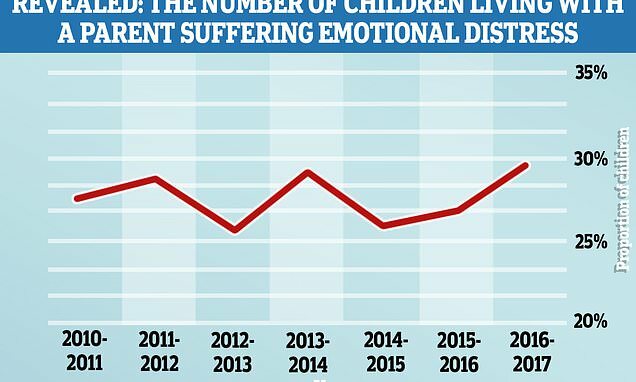 Mothers are much more likely to report emotional distress, with more than one in five (22.3 per cent) children living in a household where the mother was suffering. The figure for mothers is up from 20.2 per cent the year before and the highest on record. It compares with around one in eight (12.1 per cent) children living in households where it was the father who was distressed. In some households, both parents are reporting emotional distress. Around half of all children (50.6 per cent) living in families where neither parent was in work had at least one parent reporting symptoms of emotional distress. This compares with 26.4 per cent of children living in families where at least one parent was in work. For lone-parent families where the parent was not in work, 37 per cent of children had their parent reporting distress, compared to 34.2 per cent if they were working. A Public Health England spokesperson said: 'Parental emotional distress can lead to mental health problems including anxiety or depression. The analysis showed that children were more likely to live with a parent reporting emotional problems if both parents were out of work.